This is a rectangular glass showcase. The open face design allows for easy access to the items on display. The sleek and minimal design blends well with any pre-existing decor. 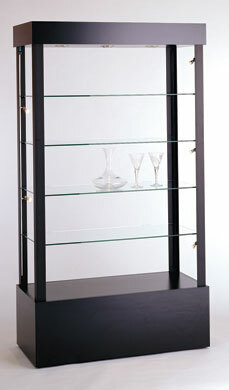 This glass showcase comes standard with wheels. This increases the showcase’s versatility greatly. Shown in black laminate, it is available in all standard finishes and custom finishes are available upon request. Basic assembly is required on this showcase, no tools necessary. Side frame poles are available in black only. Top and bottom cabinets are available in all standard finishes and custom finishes upon request. Three 50 watt halogen top lights for the 40"
Four 50 watt halogen top lights for the 48"
The four adjustable tempered glass shelves on this glass showcase are perfect for accommodating differently sized items. There are also top lights to increase the visibility of the displayed items in this glass showcase.